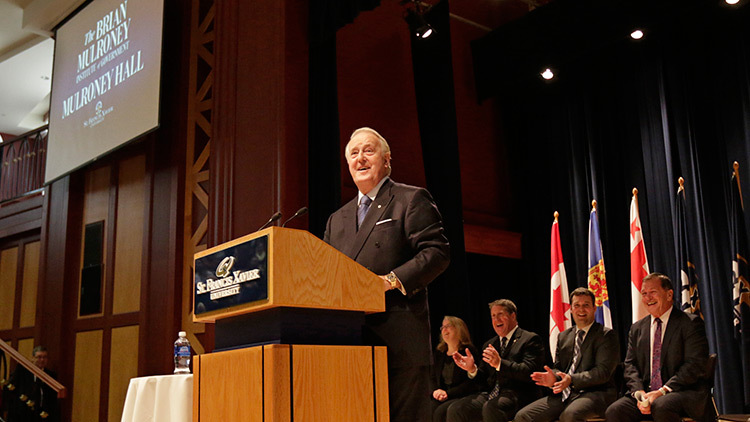 Hearty applause and a standing ovation greeted Canada's 18th Prime Minister, the Right Honourable Brian Mulroney, and the news on Oct. 26 that StFX will be the home of the $60 million Brian Mulroney Institute of Government. The announcement was made before a capacity crowd in StFX's Schwartz Auditorium. “This announcement is the most significant in the history of our venerable institution,” StFX President Dr. Kent MacDonald told the standing-room only crowd and the stage party that included Mr. Mulroney, his wife Mila Mulroney and daughter Caroline Mulroney Lapham, Deputy Chair, TD Bank Group, the Honourable Frank McKenna, Nova Scotia finance minister, the Honourable Randy Delorey, and emcee, StFX Dean of Arts Dr. Karen Brebner. “This is the most transformative project in the history of StFX,” Dr. MacDonald said as he provided an overview of the new academic institution, the first of its kind in Canada, and what it will mean to StFX, to students, and to the area. Dr. MacDonald thanked Mr. Mulroney, a graduate of the Class of 1959, who he says more than anyone is responsible for the $60 million raised, almost singlehandedly carrying this project on his back, including a $1 million personal gift from him and his wife Mila. Of the $60 million raised—of which $55 million has come from private donations and $5 million from the Government of Nova Scotia—the StFX Board of Governors has approved $40 million towards the construction of Mulroney Hall, which will house the Mulroney Institute, Canada’s leading centre for undergraduate teaching and research in the field of public policy and governance. The institute will offer a four year degree in public policy and governance. The 75,000 square foot Mulroney Hall, to open in late 2018, will replace the dated Nicholson Hall with a modern learning space on upper campus with flexible and modern learning spaces, a 300-person auditorium, an open atrium, a new centre for teaching and learning, labs and office spaces. When guests visit they will also see hundreds of artefacts spread throughout the building, memorabilia from Mr. Mulroney’s nearly nine years as prime minister, items that reflect significant moments in Canadian political history. Visitors will find a trove of historical documents and will visit a replica of the prime minister’s office including his original desk, and the desk of first Canadian prime minister John A. Macdonald, a gift Mr. Mulroney received from the Conservative Party. Beyond the building, a second transformation will include over $10 million for at least six new academic chairs. These academic chairs will be dedicated to areas including Canada-U.S. relations, climate change and the environment, human rights and the advancement of women, and the Irving Shipbuilding Chair in Arctic Marine Security Policy. Mr. Mulroney, he said, has been absolutely resolute and unwavering that the institute must be more than a building. Its real impact will be attracting outstanding students regardless of financial background, he said. “It was a high honour for me to be of some service to this special place,” Mr. Mulroney told the crowd that spilled into overflow rooms and watched the announcement live via stfx.ca. Mr. Mulroney recalled growing up in Baie Comeau, Quebec and a conversation he had one night with his father Benedict, a conversation he says he will never forget. The son told his father about an apprenticeship opportunity at the paper mill where his father worked, and which would provide him with a good wage and a job for life. The elder Mulroney told his son he knew times were tough and the money would come in handy. But he said, “the only way out of a paper mill town is out of a university door and you are going to university. “That’s how I ended up at StFX,” the former prime minister recalled. “Arriving at StFX, I knew it opened the door to a wider world. I could sense it. Mr. Mulroney, who for years has funded major student awards at StFX through the Benedict Martin Mulroney Scholarship—“in memory of a man whose life and sacrifice made everything possible for me”—says he learned much at StFX, leaving with his degree and values instilled by superb faculty. StFX, he said, is a remarkable place for creating leadership, and has long played a disproportional role in Canadian politics. In fact, at one time three of the four officers of parliament were StFX graduates. Today, he said, is all about how the Brian Mulroney Institute of Government will help StFX enhance its vital role in leadership development to better serve the citizens of this beloved country. Mr. Mulroney thanked the gracious and generous donors, his wife Mila and daughter Caroline, Mr. McKenna, and the Government of Nova Scotia for all they have done to support the institute. Mr. McKenna, who joked to the crowd it was sweetly ironic to be at the McKenna Centre for Leadership, announcing the Mulroney Institute of Government, recognized “the absolutely extraordinary heavy lifting done by Mr. Mulroney himself on behalf of StFX.” It’s a testament to the huge respect held for Mr. Mulroney by people around the world who may not have heard of StFX but are giving to support Mr. Mulroney, he said. Mr. McKenna also thanked the vision, energy and tenacity of former StFX President Dr. Sean Riley who helped get this project started and current StFX President Dr. Kent MacDonald for taking it on and carrying it forward with much determination, and for the extraordinary efforts of Ms. Mulroney Lapham on the project. In announcing the $5 million contribution from the Government of Nova Scotia, Mr. Delorey told the audience, filled with many students, to take a moment and look at the stage party behind him, to think of these individuals who walked this campus and studied in the classrooms, and to look at the students beside them and to think of the accomplishments of the alumni of tomorrow. “You never know the path you’ll take or where classmates may go,” he said as he noted he hopes the project reminds students that any path is possible. The Nova Scotia government believes in the importance of education and the role of our youth in the future prosperity of our province, he said, and that that foundation begins at academic institutions.